Summertime (or honestly, most of the time) at Walt Disney World is HOT! One great way to cool off is with a mister fan. My mom has been carrying a very small fan from Brookstone for as long as I can remember. This past trip, I bought Tink her own Disney fan. This water bottle/fan creates a nice mist and was about $8 at my local Walmart. I added a lanyard we had at the house and Tink was all set. Disney sells their own version for at least twice that. Disney does tend to chill their mister fans on ice but ours stayed under the stroller (dry!) until we needed it and then I filled it from a drinking fountain. Now of course, for a four year-old, it is mostly just another way to play with water but I'd call it money well spent. 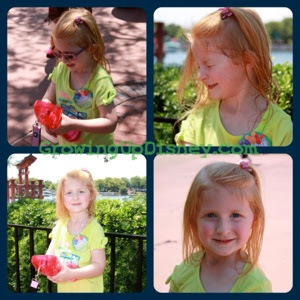 Thanks to DisneyDad for capturing these adorable photos! Thanks to Deb at Focused on the Magic for another fun topic! Today's post was inspired by her theme of The Disney Days of Summer. Those fans have been a lifesaver on several occasions! A great prop for summer! Cute shots! So cute! The mister bottles are a must for summer days! 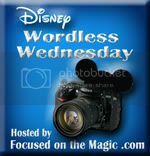 Thanks for sharing and for joining in the Disney Wordless Wednesday Blog Hop fun. Great Pics! Totally agree that it's a great thing to have with you, and even better if you get it outside the parks at half the price! Adorable pics Amy, what a sweetie!! Mary, you crack me up! This was our first time to carry a fan for Tink and it didn't come out often since she mostly just played with it. Was still nice for a hot day though. So sweet!!! Great pics this week! We have one of those fans, but I just hate to carry them around b/c they're bulking. They do feel good in the summer though! Thanks Jodi! I hate being the park sherpa so this was more compact than the Disney version and VERY lightweight when empty. I am your newest follower! When at Disney on Memorial Day I wanted a fan like this so much! I love your blog! Welcome! And I'd bet you'd want a fan for Memorial Day! We were there at the begining of May and it was hot enough for me then. Great idea - love the pic where she's sprayed herself in the face!! Photo Flashback! Mickey, My how you've changed!